After a little summer break we’re back with a brand new episode. And I'm 100% sure that it’s going to switch on your inner light and belief in the good people in this world! 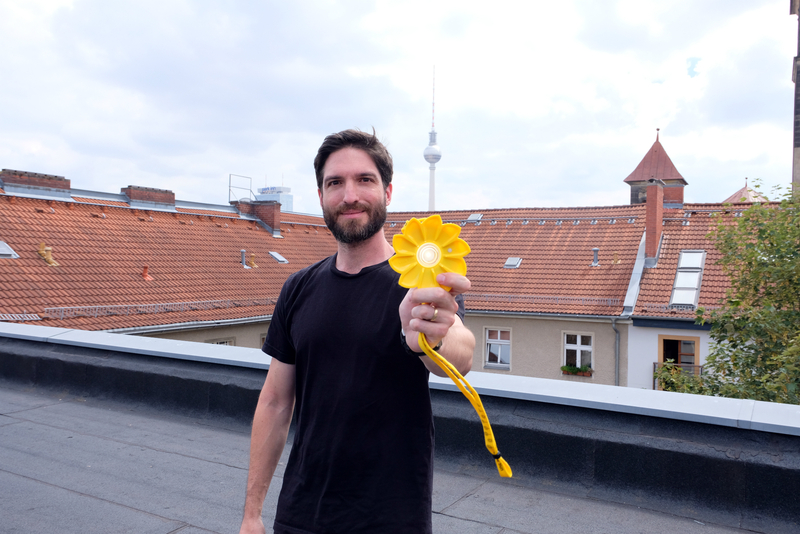 Claudi sat down with Felix Hallwachs, Managing Director of a beautiful social startup called Little Sun (@ilovelittlesun). How can something so simple as a tiny sun-shaped solar lamp the impact the lives of millions of people ? Why can micro-entrepreneurship in sub-Saharan Africa be much more powerful than financial aid? How can anyone of us leverage the connections we have to be part of something that matters? And how can we keep up our flame of motivation when things get tough? That’s just a mini-preview of all the inspiration bombs Felix drops in this episode. Extremely proud to present you another Berlin-based certified B-Corp with a fascinating story. If you haven’t heard of it yet, Little Sun is a social business spreading clean, affordable solar energy around the globe. Just a couple of mindblowing numbers to get you into the scene: Since Little Sun started in 2012, it has sold 661,578 lamps sold worldwide, changed 1,648,386 lives off-grid, built up new opportunities for 600+ African entrepreneurs, saved an insane amount of $35,531,865 on energy expenses in off-grid households and reduced 134,572 tonnes of Co2 emissions! That was in December 2017, so their impact has been growing even bigger since. Little Sun has also won a competition by the United Nations Development Program for access to clean energy in Senegal, launched the Little Sun Foundation and - an image that can hardly be topped in beauty - brought together artists, musicians, and activists in New York in the eve of COP23 to urge policymakers and political leaders to join the fight for climate action. Imagine 2,800 people holding up Little Sun’s, creating a collective work of art that stands for a solar-powered sunrise….. Goosebumps! Felix also mentions heaps of other great impact projects AND gives some big shout outs to you guys, the listeners - including a burning question that maybe some of you could help answer in the end. So make sure to listen carefully and check out the show notes. As always, we’d be super grateful if you hop over to iTunes, subscribe to the podcast and leave us a short review. It helps us keep going and makes the show available to more people. THANK YOU! „...our reality vs. the reality of people in many other parts of the world… Let’s stop, zoom out and think about it "
„ Suddenly being good becomes a currency - and that I believe is fantastic "
„ I’m generally inspired by the fact that we somehow get this huge opportunity to do something great "
„ I think there is something in our story that is bigger and that remains to be told "
Connect to the sun from Little Sun on Vimeo. ...GreenMe Tours: If you’re in Berlin and looking for an alternative way to explore the city while meeting some beautiful sustainable businesses & the people behind them, join one of GreenMe Kiez Tours. We’ve got public tours running every 2nd Saturday through to the end of September. So check out our next dates and join us! Would be great to have you. ...Wanna jump to the next level & learn how a world without waste, less overconsumption & more human connection could look like, check out our Circular Economy Tours. ...Lastly, if you’re a foodie and prefer to explore on your own, make sure to check out our huge Best of Vegan Brunch Guide featuring our favorite plant-based havens in Berlin & fill your bellies with vibrant nourishing food from nature… ENJOY! ARE YOU UPLIFTED BY THE APPROACH OF LITTLE SUN? MICRO-ENTREPRENEURSHIP VS. DONATIONS - WHAT CAN HAVE THE BIGGER IMPACT? get our best-of green Berlin guide to 7 exciting places for free!